The premise of the latte effect is to sacrifice the purchase of your daily latte in exchange for saving and/or investing that money. In other words, short term sacrifice for long term gain. Yes, saving the individual cost of a latte won’t make a difference, but collectively saving that expense annually you could potentially stack away a lot of cash. You can use the money towards saving for your retirement, buying your first place or building your emergency fund. I first became familiar with the latte effect after reading “Smart Women Finish First” (Canadian edition) by David Bach. He has an entire series: Smart Couples Finish Rich, Automatic Millionaire, Start Over, Finish Rich, etc. There’s something for everyone and it does not matter what stage of life you’re in. What I like about David Bach’s books was that he has realistic savings advice. At the time I was not making a lot of cash but I really wanted to start saving for my future. He brought awareness to areas in my life where I could cut back and start saving. 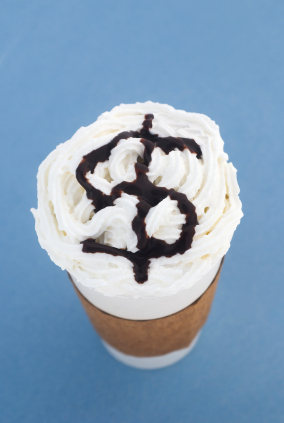 How much would you save if you purchased a $4 latte every time you worked? Let’s assumed you worked five days a week and 50 weeks a year (the other two weeks you were on vacation). Every morning before work you purchased a $4 latte at your favourite coffee house. Wow over $1000 a year on coffee!!! I bed you didn’t think you spent that much on it. Now what if you did that over a 5 year period? I’m going to assume you aren’t storing this money under your mattress and will be investing it so you’ll be saving even more. If you’re not a coffee drinker (like me) I’m sure there’s another item you regular spend on that you could cut back. Do you purchase books? Try going to the library. Eat out often? Start bringing your lunch from home. Or live without cable like I do (most of the stuff on TV is crap anyway). It does not have to be an all or nothing approach either. If you are not completely wanting to give up your latte (or your <<fill in the blank>>? Try giving it up four days a week and treat yourself to one Fridays. Or if you order large lattes switch to a smaller size or buy at a coffee shop that isn’t as frilly. Following the latte effect isn’t going to make you a millionaire overnight. It is however going to make you more conscience of those frivolous spending. Remember the latte effect only works if you move that money into a separate account for savings. If you just leave in it your account you’re more likely to spend it somewhere else. Small sacrifices add up to big savings in the future. What more smart ideas like the latte effect? Click here.